Success the previous day, capturing both the Junior Boys’ Team and Junior Girls’ Team titles, Egypt completed the clean sweep on Tuesday 10th April at the 2018 African Junior and Cadet Championships in Abidjan, Côte d’Ivoire. The Under 21 Men’s Team and Under 21 Women’s Team titles were secured as were the Junior Boys’ Team and Junior Girls’ Team gold medals. 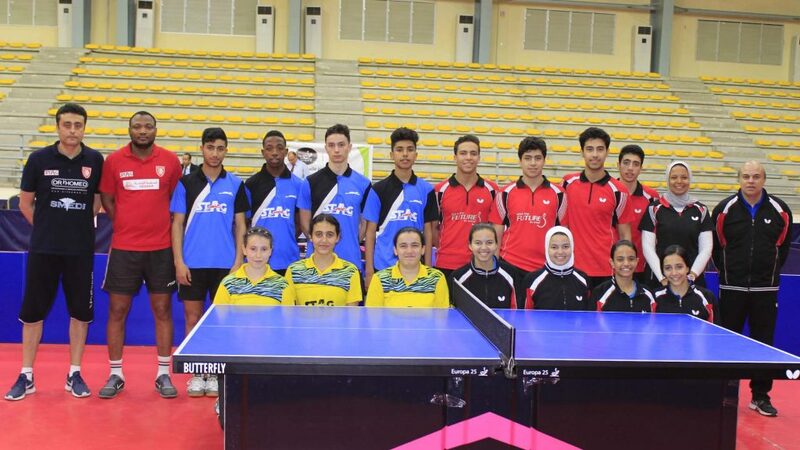 Aly Ghallab, Youssef Abdel-Aziz and Mohamed Hussein combined to win the Under 21 Men’s Team event recording a three matches to one win over the Tunisian combination of Nathael Hamdoun, Chouayb Lagha and Mootezz Saadaoui. First and second places respectively for Egypt and Tunisia, it was third place for Algeria; in the play-off contest, the trio of Azzeddine Lazazi, Abdelbasset Chaichi and Abderrahme Sebia recorded a three-one win in opposition to Togo’s Kossi Akakpo, Atarou Assou and Kodjo Boccovi. Likewise in the Under 21 Women’s Singles final it was a three-one victory margin for Egypt; the outfit formed by Amira Yousry, Marwa Aldhodaby and Mariam Alhodaby accounted for Algeria’s Sannah Lagsir, Hiba Feredj and Malissa Nasri in the title deciding contest. A three-one success for Egypt in the third position contest it was a three-nil margin of victory for Tunisia’s Abir Haj Salah, Fadwa Garci and Manel Baklouti in opposition to the Côte d’Ivoire trio formed by Rebecca Hounge, Christine Kamenan and Salie Aka. Imposing performances from Egypt, it was the same in the Cadet Boys’ Team final, the partnership formed by Ziad Elshawa and Mohamed Azzam overcame Tunisia’s Khalil Sta and Youssef Abid by three matches to nil. Third place finished in the hands of Congo Democratic; they recorded a three-two won over Algeria’s Abderrahmane Azzala and Meziane Belabbas in the play-off contest. Emphatic in the Cadet Boys’ Team final, it was exactly the same from the Egyptians in the Cadet Girls’ Team gold medal fixture. Sara Elhakem and Hend Fathy proved too strong for the Algerian pairing of Melissa Belache and Hadjer Tahmi. Third place was secured by Tunisia’s Farah Mahjoub and Maram Zoghlami; similar to the Egyptians, they showed no charity, a three-nil win was recorded against the South African partnership formed by Kiara Naidoo and Yashka Rabichan. Following the conclusion of the Junior Boys’ Team and Junior Girls’ Team events, the selection for the 2018 World Junior Championships to be staged in Bendigo, Australia was announced. Egypt and Tunisia will each compete in both the Boys’ Team and Girls’ Team events.